I grew up in the eighties. The time of an increasing amount of convenience food (at least how I see it). My parents embraced every new fad diet, every invention (who else has a salad shooter? Baked potato cooker for the microwave?) and since they both worked, any and all food that made feeding 3 kids easier. My husband and I take a much different approach to food. If Grandma didn’t have it, or there is more than 3 ingredients we can’t say, we avoid it. We’re not perfect, but we try hard to abide by this. We strive to make all our own meals (6 nights a week) from scratch, or mostly scratch. We eat fresh whenever we can. Part of it is for taste, my husband especially is what I lovingly refer to as a food snob. A bigger part of it is our genes. We need to pass on healthy habits to our children because when it comes to cardiovascular health, the cards are stacked against them. From their mother they get weight issues, diabetes, high blood pressure, high cholesterol, atherosclerosis, etc. From their father they get a history of aneurysm and probably high blood pressure. Knowing our history (and with my background and passion being in medicine) we very consciously work hard to make sure we are eating healthy, with particular attention to heart healthy foods. The American Heart Association recommends high fiber, low sodium, low fat diet filled with fruits and veggies. I'll be the first to admit this is not always easy. I have one child who is underweight and needs to have a higher fat diet and one picky eater. My husband loves salt, wings, and beer. I love baked goods, chocolate and when not pregnant wine with an occasional martini. Not to mention that in the Midwest starting, oh about now, fresh fruits and veggies are harder to find and more expensive. Thankfully I have two secret weapons, frozen veggies and canned tomatoes. Frozen fruits and veggies are just as (or sometimes healthier) than fresh counterparts especially if the alternative is to go with out them all together. Canned tomatoes are a staple in our house as my husband likes to pretend he is Italian. I would guess that we have a meal with tomatoes at least once, if not twice a week. ConAgra Foods (the makers of Hunt’s Tomatoes) recently released reports on just how healthy canned tomatoes can be. I was excited to read them, I knew about all the prostate healthy benefits of lycopene in tomatoes, but was unaware of the heart benefits. 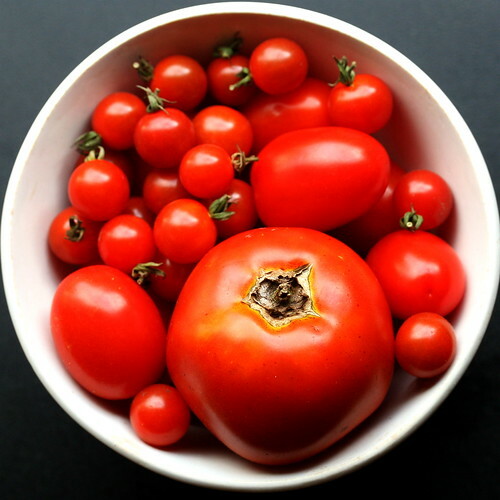 Recent studies have suggested that the distinct combination of nutrients found in tomatoes may have a measurable impact on heart disease prevention. All good things when you are trying to maintain a healthy lifestyle! So what do I use my canned tomatoes in? Chili Mac is something that we make in a minimum 2 pound batches in the winter because my son (the underweight one) wolf it down like he has been lost at sea for 3 weeks. It also makes great leftovers for those rushed dinners after Advent masses or for hot lunches for a certain pregnant mom. Here is our recipe for Football Worthy Chili, take note, it’s not the healthiest (see: underweight child eats it). To make it healthier you can leave out the bacon and beer, and add more veggies or use a combination of a leaner meat such as sirloin or ground pork, we have even made it with ground turkey. In Large Stock pot fry bacon until brown but not crunchy. Stir in all remaining ingredients except beans. Heat to boiling, reduce heat. Cover and Simmer at least 1 hour stirring occasionally. Stir in beans Heat to boiling, reduce heat. Simmer uncovered about 10 minutes, stirring occasionally until desired thickness. We serve over elbow noodles for me and the kids and spaghetti for dad topped with shredded cheddar cheese. Disclosure: I was compensated by The Motherhood for passing on the research information released by ConAgra foods. The opinions and recipe are all mine.